David Crowder was in a rut. After playing countless summer music festivals where he recycled the same jokes about Wal-Mart lawn chairs and Nintendo video game consoles way too many times, his fortunes—at least in terms of creative output—had fizzled. The gifted songwriter had become a bearded caricature of himself, offering slightly different chord progressions on the same basic worship songs ad nauseum. In early 2012, he played his last concert as the David Crowder Band at the Passion Conference in Atlanta, finally freeing himself to write a new musical chapter. 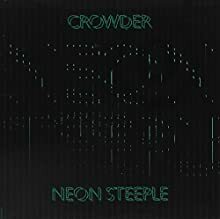 On Neon Steeple, which released on May 27, the Waco native has not only reinvented himself but gone quite a ways toward reinventing the Christian worship genre. Along with Gungor, which is not really a worship band at all anymore, Crowder (the solo last name, like Gungor, now does double duty for the founding artist and the band) rolls into one the country pomp of Mumford & Sons, the operatic charm of The Avett Brothers, and the twangy grit of Hank Williams, Sr. "Christian music" already sits kitty-corner to mainstream country on the musical matrix (and, in many cases, is vetted and marketed by the same Nashville label cubicle farm), and Crowder the artist has always toyed with classic country music, but something bigger is going on here than just a label-approved rootsy turn.